Solutions when your primary antibody is the same species as your specimen. When a primary antibody is the same species as the specimen, the secondary antibody cannot distinguish between the endogenous immunoglobulins and the primary antibody. 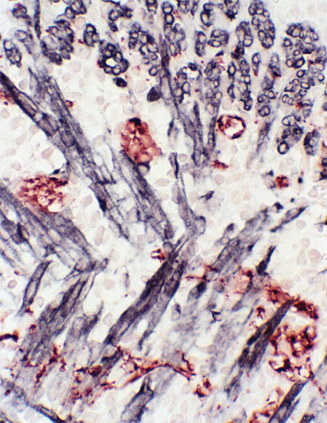 This can result in high background staining that obscures antigen-specific staining. Mouse on Mouse detection is especially important because of the vast number of primary antibodies made in mouse and the wide use of mice in model systems, xenografts, and other applications. Newborn Mouse Tongue: • Synapsin (m), M.O.M.™ Peroxidase Kit, Vector® NovaRED™ (red) • Desmin (m), M.O.M.™ Peroxidase Kit, Vector® DAB-Ni (black).